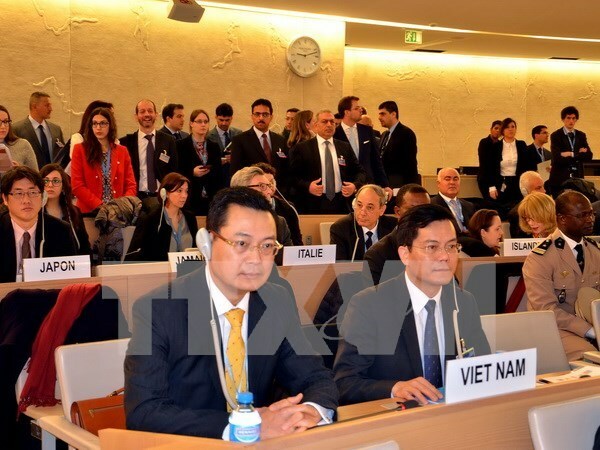 Geneva (VNA) – Deputy Foreign Minister Ha Kim Ngoc, head of the Vietnamese delegation, participated in a panel discussion on adverse impacts of climate change on children’ rights, in Geneva, Switzerland, on March 2, as a panellist. He highlighted wide-ranging effects of climate change on ensuring children’s rights in Vietnam, and suggested developing child-centred policies in climate change adaptation. It is indispensable to increase public knowledge and awareness on climate change and its impacts on children as well as enhance regional and international cooperation in the field, he recommended. He also mentioned challenges to combat negative impacts of climate change on children’s rights. For developing countries, the lack of resources, and poor infrastructure and forecast capacity made it harder to adapt to and mitigate the impact of climate change on vulnerable groups, including children, he said. The bigger challenge lay in raising awareness on how climate change hurt children’s rights. Only when adults fully comprehended how climate change could obstruct the growth of children would the international community be able to build children-centred climate change adaptation and mitigation policies, he added. He shared Vietnam’s experience in integrating children’s rights into climate change policies as well as underlined the collaboration between the Vietnamese Government and the United Nations Children’s Fund (UNICEF) and international partners in building child-centred strategies to mitigate natural disaster risks. The same day, Vietnam held an international workshop to educate children on climate change, with the participation of more than 100 delegates from the UN agencies and non-governmental organisations. Deputy Foreign Minister Ha Kim Ngoc shared Vietnam’s efforts in building policies and mobilising schools, communication, families and the whole society to raise awareness of climate change for children. He stressed the importance of equipping children with basic knowledge about the environment, climate change, and necessary skills to mitigate the risks of natural calamities.